Most intracardiac EP procedures are analogous to painting the inside of a room; I have found that in many procedures, without ICE you are painting in the dark. Charles Darwin said, “It is not the strongest of the species that survives, nor the most intelligent, but rather the one most responsive to change.” Within the last decade, the field of Electrophysiology has progressed in term of technology and breadth of procedural variety. Part of this development has been the use of adjunctive imaging during EP procedures. The following video depicts an ex-vivo heart preparation undergoing a radio frequency ablation. One can imagine the trauma that a steam pop could cause during an EP study in which the ablation catheter is confined within a small trabeculation in the right or left atrium. Direct visualization of the ablation electrode-endocardial interface is possible with intracardiac echo (ICE). ICE permits us to watch for increasing echogenicity of endocardium and possible overheating. 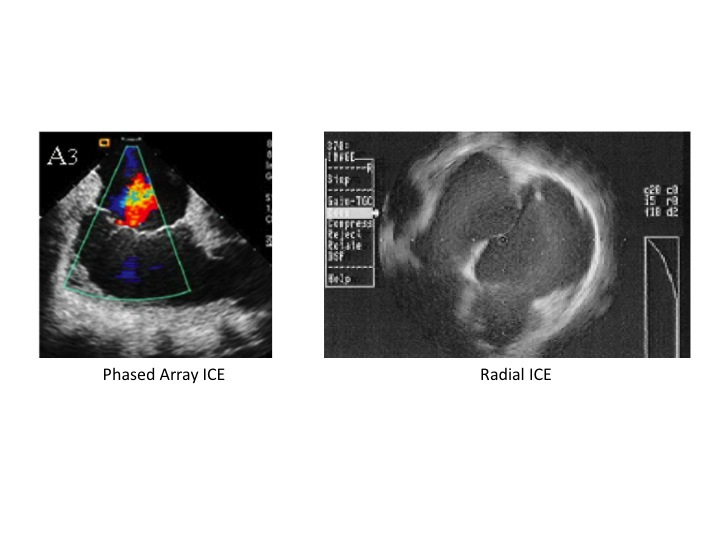 In addition, the development of catheter or sheath thrombus can be detected by direct visualization with ICE. There are two main types of ICE: Phased-Array and Radial. 1. Phased Array: 8-10 French, 5.5–10 Mega Hertz catheter with 90° sectorial sector image and Doppler capability (AcuNav®, Acuson, a Siemens Corporation, Mountain View, California). Phased-array generally offers better image resolution/definition and doppler capability. The doppler capability permits assessment of valve disorders such as stenosis (blockage) or regurgitation (leaking). The cost is higher. 2. Radial (mechanical rotation of the transducer): 8.5 French, 9 MHz catheter with 360° radial image (Ultra ICE, Boston Scientific, Natick, Massachusetts). This catheter has no Doppler capability and image definition is not as good. 360° scan has a larger field of view and allows for a more comprehensive depiction of both atrial chambers and atrioventricular valves with their relationships and it also can be used as IVUS for great vessels. Next Post: Pathophysiology of Intracardiac Ablation: How Does Ablation Work?